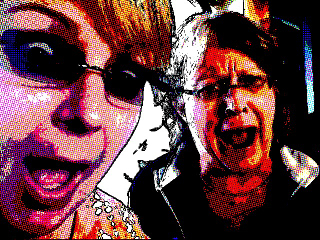 Jennifer is a retired staff writer for National Geographic and delightful traveling companion. ( This photo is before we discovered Mai Tais were the drink of the day. And no, I didn’t have that many.) The Potato Latitudes are when you’re on a long trip in the middle of a huge ocean and there are no resupply opportunities. Today at lunch we had potatoes made three ways, we had other things, but make no mistake — we are in the Potato Latitudes! 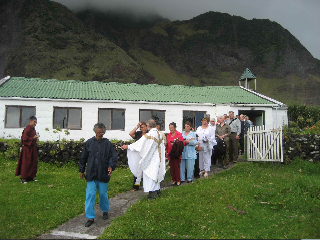 Yesterday morning I got up at dawn to attend Easter Sunday services at the Anglican church in Tristan da Cunha. I figured the opportunity would probably never arise again in my life. The Tristanians were all so respectful — never yawning or sweating (the air was very warm and still), always seeming to know where we were supposed to be in the Hymnal, what to repeat, how many Amens to say. Church services are a very interesting study of how to keep people involved (and awake). We were constantly having to stand for some reason or another making dozing impossible. Then there’s the singing — and this crowd loved to sing and sing loud. We didn’t have proper hymnals with words and music — these had just the words and tiny ones at that. I could barely read them without my glasses (what was I thinking?? I wouldn’t have to read at a church service??) My biggest decision was whether or not to take communion. After wrestling with it for several minutes (I had time to think since I was in the back of the room) I went ahead — thinking I would stick out even more not going and thinking what harm would it do? No point to refuse a blessing — especially when it’s given with so much sincerity. Barnaby stayed in bed, but joined me on the island with the later group. The ocean swells got so bad, we were barely able to get back on the ship and all felt lucky to have been able to go ashore at all. Tristan da Cunha has to be one of the most unusual places we’ve ever visited. Picture an island, 7,000 feet at the top of a volcano, about 1,500 miles west of Cape Town, South Africa and 1,200 miles south of St. Helena (the island where Napoleon was exiled and died) in the middle of the South Atlantic. We’d been sailing from South Georgia for 4 solid days to get there. There were no indigenous people and was only settled in the mid 1800s by a Scotsman. There are only 7 surnames and yet the 271 people who live in Tristan are pretty varied genetically because of the original settlers: a Scot, American, English, Dutch, Portuguese and two shipwrecked Italians that decided to stay. There is no airport, no safe anchorage (only 1 day in 5 can you safely launch a boat), no crime, and no divorce (though I suppose if you were really unhappy you’d just leave). Until 1945, they had no money and used potatoes for all their trading. Then, in 1960, the volcano erupted and all of the residents were evacuated to England. After 18 months, they plead to come back, bringing the Beatles music and a small taste of modern society. But they were still ready to give up the comforts to get back to their lovely Eden. I imagine it is very hard work living there: they fish, raise potatoes and other vegetables, have sheep, cattle, chickens, pigs and love to eat the occasional penguin egg. But much like Idyllwild, it’s a small town, everyone knows everyone else’s business, and yet everyone sticks together. Another interesting phenomenon is there’s an equality (no real estate moguls like Pete and Vic), everyone has a place — a purpose. Our little town is kind of like that too — we all accept Tuxedo Tim and Warren the Car Washer, they may be a little off level — but they still have a place in the community. It’s a fascinating anthropological study and I’ll be curious, now they have internet and satellite TV, to see what it’s like in another 10 or 20 years. It’s very appealing though I think you would probably have to have grown up there to fit in. 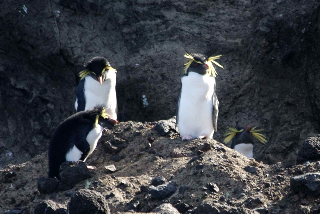 For our last penguin shot of the trip — we have the Tristan Rockhopper which is probably the most outrageous of all. Sadly, we were not able to land on Nightingale Island (there are three islands in the Tristan group: Tristan, Nightingale and Inaccessible) to visit the colony so I had to take photos from the Zodiac. They have red eyes, pink feet and the bright yellow feathers on their heads, and since the Tristanians like to steal their eggs — are probably not very friendly to humans. Now that we’re approaching the Tropics, all the polar fleece and long johns are packed away. We had a barbecue dinner on the deck tonight. Everyone saw the green flash at sunset. 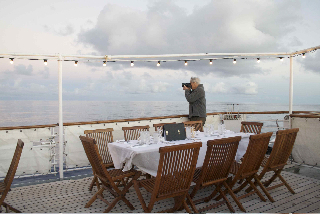 Our next stop is St. Helena — another extremely isolated island but nothing like Tristan. This entry was posted on Thursday, August 26th, 2010 at 6:47 am	and posted in Uncategorized. You can follow any responses to this entry through the RSS 2.0 feed. This is my favorite story and place yet that you have been to and written about! I love it! Potatoes?….That’s rocken!